Looks like Lincoln before the Miami game. According to the New York Times, the protesters are picking up their own trash, and even separating the recyclables. The demonstrations might be a canary in the coal mine for the Chinese system of governing, but it’s hard to believe that the government will bend, or that this will spark a pro-democracy movement across China. I fear that real reform will have to wait, perhaps for a few decades. Joan was born in China. Her mom and dad, who were Americans, stayed there after the war until Mao took over. We first went to China in 1994 and have returned several times. While I agree with you “that real reform will have to wait” in the sense we think about representative democracy, the reforms that China has made since 1994 are staggering. One frequently overlooked reform relates to currency. In 1994, there were two Chinese currencies–one for internal use and one for external use. That is no longer the case. In effect, China devalued the currency used by the Chinese as it began to look seriously at the outside world. In my opinion, this put China on the path to economic liberty and that will inevitably end in political liberty. I love China. I hope it continues along the path of reform. Academic on PBS News Hours last night said the police have not engaged much. He does not expect it to stay that way. Judge–I should have been clearer: I was talking about political reform. Clearly, there have been substantial changes in many other areas. Can the nation become a truly modern state and maintain its status and stature without much more democracy? The government apparently thinks so. I do not. I guess history will decide. I agree with you. But with econmic liberty flourishing in China, democracy is sure to follow. That said, the Chinese measure time very differently than we Americans. I know the Chinese military has a garrison on the island. I wonder whether the HK police would crack down. I would hope the PRC would be reluctant to use the military. But we shall see. It is impressive, how calm the protests are. What really…interests…me, though, to take a short side trip, is how silent the Brits are. They’re the ones who signed the turnover documents that also included the PRC’s guarantee of Hong Kong’s own political system for 50 years from 1997. With the PRC’s abrogation of that, via its decision that its own nominating committee would determine the outcome of Hong Kong’s “election” for its Chief Executive, we now have the spectacle of Brit timidity. 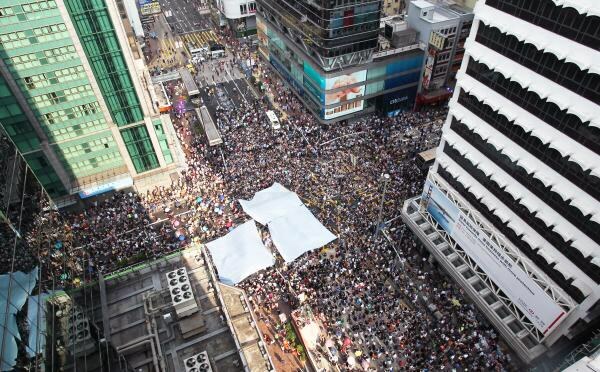 Which is louder than the Hong Kong protests. In the face of that timidity, the PRC has, via an editorial in the People’s Daily, threatened another Tiananmen Square. 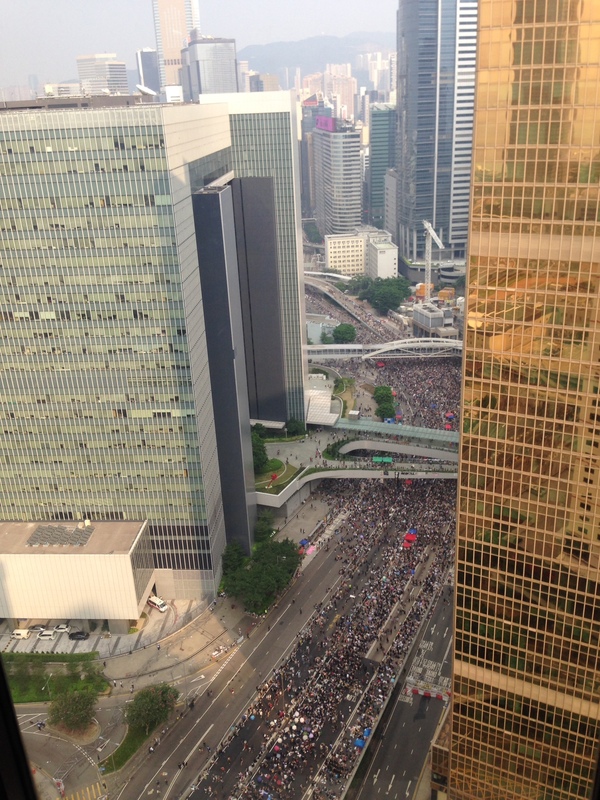 Incidentally, Instagram, Twitter, Facebook, et al., still seem to work just fine in Hong Kong. Eric, I don’t have time to search for a link, but the Times (that’s the New York Times) reported today that the Brits have called in the Chinese ambassador to let him know they are not happy about what’s going on, and the Chancellor of the Exchequer (why don’t we have cabinet members with titles like that?) has also made a statement critical of the Chinese government’s handling of the situation. Yes, I’ve seen the announcement. The Deputy PM Clegg has called the Chinese ambassador to a private conversation, wherein presumably he’ll express his dismay. Osborne has said publicly, It is a concerning situation of course. Well, NSS. Those were in the New York Times, all carefully phrased for the public so as to not offend the PRC, and so just empty rhetoric. And if PM Cameron’s remarks are accurately characterized (by Fox News, this time)–it is essential that Hong Kong’s people have a genuine right to choose their top leader–this would be an amazing misunderstanding for the leader of the birthplace of John Locke to have. 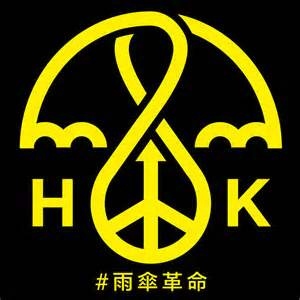 Each one of Hong Kong’s people is created with an inalienable right to his own liberty and happiness (as are the mainland Chinese, but that’s for another thread). That means he has an inalienable right to choose his own government and the men who operate it. 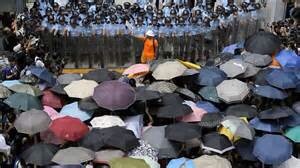 What is essential, then, is that Hong Kong’s people have that right genuinely acknowledged and accepted, not granted. Unwittingly or not, Cameron is merely echoing Li Fei, the Deputy Secretary General of the National People’s Congress’ Standing Committee: [R]ights come from laws, they don’t come from the sky. “For as long as but a hundred of us remain alive, never will we on any conditions be brought under English rule. It is not for glory, nor riches, nor honours that we are fighting, but for freedom — for that alone, which no honest man gives up but with life itself.” Declaration of Arbroath (Scotland, 1340). Some things never change. Power intoxicates. Those in power seldom yield it willingly. Everyone knew in 1997 that the Brits couldn’t control HK indefinitely, but that the transfer would end badly. Political promises are about as enforceable as a judicial oath of office, but it was the best deal that could be struck. Jefferson wrote that a Bill of Rights “is what the people are entitled to against every government, and what no just government should refuse, or rest on inference.” China technically has a bill of rights, http://english.gov.cn/2005-08/05/content_20813.htm, but its constitution imposes a duty to “not infringe upon the interests of the state, of society or of the collective” in the exercise of their freedoms. In effect, the Party wrote hegemony into their law, and their constitution is the highest law of their land. And in a sense, Hong Kong is Scotland: a conquered land. You are a judge for the PRC. You preside over the prosecution of Occupy HK’s leaders. On the one hand, you have a treaty with Britain, purporting to guarantee self-determination for 50 years. On the other hand, you have a constitution in conflict with that treaty. How do you rule? Do you cite Reid v. Covert as precedent? Hold on. How is the Chinese constitution in conflict with the treaty? Why do you assume that an honest Chinese judge following Anglo-American legal reasoning could not come to the conclusion that requiring central government approval of HK candidates for the 2017 election conflicts with the treaty? I could make a reasonable argument that a facial challenge to the restriction fails because there is no reason to think that the central government will not approve all qualified candidates, and an “as applied” challenge is premature and not ripe. Fascinating hypo. Thanks for your engagement. The concept of treaty is mentioned only once in the PRC’s Constitution as amended: in Art 67, identifying the Standing Committee’s obligation/authority to act in the absence of the National People’s Congress in a time of treaty obligation with regard to mutual defense. By implication, then, all other treaties have the authority the PRC government (perhaps through its courts) says they have. Thus, the Chinese constitution is in conflict with the Hong Kong turn-over treaty because the Chinese government says it is. If they bother with such a nicety. Land in the cities is owned by the state. Land in the rural and suburban areas is owned by collectives except for those portions which belong to the state in accordance with the law; house sites and private plots of cropland and hilly land are also owned by collectives. The PRC is a rule by law nation, not a rule of law one. Good luck with those reforms. And with treaty obligations that become inconvenient to the men in power in the PRC. I assume that a Commonwealth judge would not do such a daft thing (as they never have, to the best of my knowledge), but I literally cannot find a single federal appellate panel that HASN’T pulled that stunt. Take the International Covenant on Civil and Political Rights. A ratified treaty, which is the “supreme Law of the Land.” Art. VI, cl. 2. It creates third-party rights, which are enforceable. Ware v. Hylton. The courts have to “look to the intent of the signatory parties as manifested by the language of the instrument,” Diggs v. Richardson, 555 F.2d 841, 851 (D.C. Cir. 1976), and apply domestic law in a manner that is consonant with that intent. The rest of the world — including China — expects that we are going to live up to our end of the bargain, and that dictates how courts must interpret it domestically (that is, under the daft assumption that federal judges would respect a precedent they don’t like). And the Vienna Convention asserts that domestic law is no excuse for not living up to the terms of a treaty. The ICCPR is substantially identical to the Universal Declaration of Human Rights, with one salient difference: it contains an enforcement provision. Thus, its only conceivable intended purpose is to create an enforceable international Bill of Rights by abolishing official immunities. You can understand why judges don’t like this. One of its provisions is that all persons shall be equal before the courts and tribunals, and you judges ration justice in an often flagrantly discriminatory manner (Judge Gertner). These acts constitute a separate violation of the ICCPR, and whether Uncle Sam picks up the check or you do, it holds you and your colleagues accountable. And of course, you know what happened. Your learned colleagues got out their veto pens, and dishonestly interpreted the treaty into oblivion. You can enforce the ICCPR in all of the Western world and virtually all of the Commonwealth (I wouldn’t try it in Zimbabwe), much of the Second World and a surprising swath of the Third World. Your son would enjoy its protection, as it has been enforced in Australian courts. But not us in America, where the rule of law has been replaced by the rule of judges. China is a signatory to the ICCPR, and has announced plans to ratify it. http://www.chinapost.com.tw/commentary/the-china-post/frank-ching/2011/07/20/310434/China-govt.htm. Let us say that they do, and a member of your family has a cause of action. They march into a Chinese court, asking for relief. Does the Chinese judge follow the American precedent your friends and colleagues created and declare that the ICCPR is just meaningless goo, telling your wrongfully injured family to pound sand? Reid v. Covert holds that our Constitution is the supreme law of the land, and both statutes and treaties inconsistent with it are void. If a Chinese judge followed American precedents, he could ignore the treaty and say so openly. No need to debate how many angels can dance on the head of a pin (the “as-applied challenge” dodge). In other words, like the old Soviet Union and present-day America. When treaty obligations become inconvenient to our rulers on the bench, they “interpret” them into oblivion. The Soviet Union never bothered to conceal this, and American courts have followed their lead. The only dispute in which an American appellate court has even given lip service to the ICCPR is the Puerto Rico voting rights cases (Igartúa de la Rosa v. United States; 4 cases), where Judge Torruella makes a compelling argument for its enforcement. Think about it: In a nation created under the banner of “no taxation without representation,” four million American citizens have no say in their government at all and another half-million, no representation in Congress. And our true rulers, with an absolute veto power over the Constitution itself (Hans v. LA), are not accountable to anyone.